Today felt like a bit of a low day, I think we're a bit tired, a bit achey and the weather isn't great either. We had another quick wander around the high street this morning to find breakfast, though the rain was getting heavier and the wind picked up so out came my poncho. Not impressed. 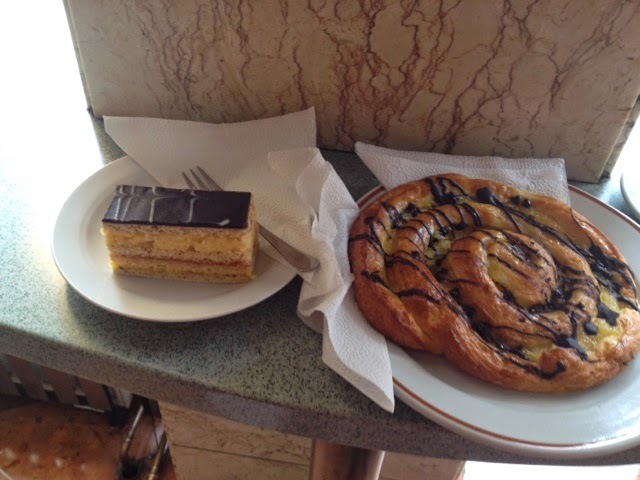 And then the traditional coffee shop we were searching for as a recommended place of interest had three large steps, but we found another and had cake for breakfast because it's just the Hungarian way! Mine was lovely and soft but incredibly sweet, layers of soft sponge, creme patisserie and a thin layer of apricot preserve- my favourite! No one spoke English so it was a challenge to work out that we needed to buy tickets for our food beforehand, but we got there in the end. The cafés sometimes don't have tables and chairs, just high shelf like tables to stand next to, so I'm fortunate that my wheelchair has a riser so I could join in. 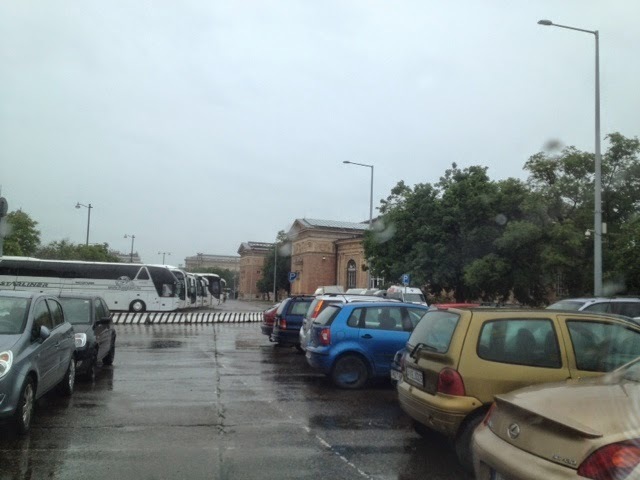 The rain got heavier still as we packed up and checked out, so I drove us up to the city park where the museums and the Szechenyi thermal spa is in hope we could visit. But I'm sorry to say we have been defeated by this weather, the rain is so heavy and the wind so strong that nothing was pleasant at all. I would love to come back and review this city properly, take in the sights and scenery a little more and enjoy the atmosphere, but it was impossible for me to do so this morning. Knowing we have only completed half of the trip makes me conscious that I'm still very far from home and to get soaked through exploring Budapest and then drive for two hours to Bratislava is going to make me ill, whether I can help it or not. We didn't stick around long and were quickly on our way to Bratislava in Slovakia, with me in the driving position. Unfortunately not far along the motorway we had to swap seats and David took over, as I was in too much pain to continue. I think that the 4.5hr drive yesterday sitting in one position had made my hips tender and then sitting in the same position (upright and strapped in) again this morning put added pressure on my hips again. This should have all been sorted before I left for the adventure, as my seat cushion has died beyond any form of repair and I'm "bottoming out " of it, which essentially means that the foam has compressed so much because it's old that I'm effectively sitting on the metal base which is hurting me. A new seat cushion kept getting delayed even though I fought continuously for it in preparation for the trip but sometimes things are out of my control. Plus a new cushion puts me in a different posture which in turn affects my driving position and ability, and there wasn't enough time for my van adaptions to be modified before we left. My next PA is bringing some extra padding with her so hopefully that will help me to be more comfortable too, because at the moment I'm leaning to relieve the pain which isn't good for my back. 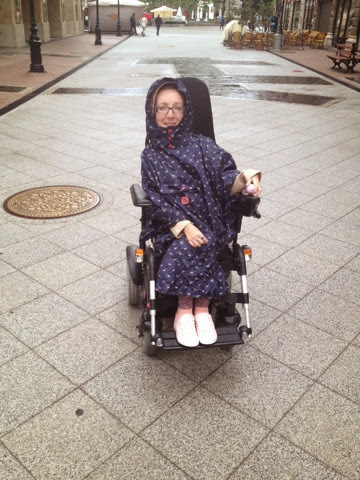 I felt like I should mention all of this in the blog as this is totally true to life with a disability, we all have good days and bad days and I didn't think I could get all the way around Europe without a couple of bad days. We are staying in a hotel near the airport in Bratislava called Hotel Chopin. The first hotel room they gave us was a standard quadruple room and in no way accessible, so David complained and we were given a lovely double disabled room with an adjoining standard twin room for my PA! 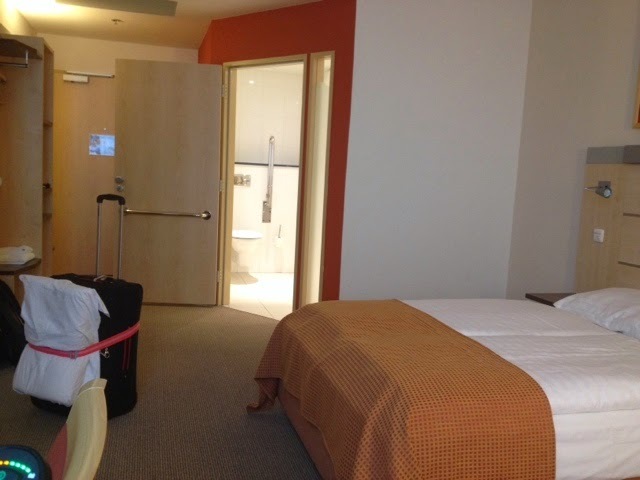 This is much better, the room we are in is huge and the bathroom is the biggest we have had so far. 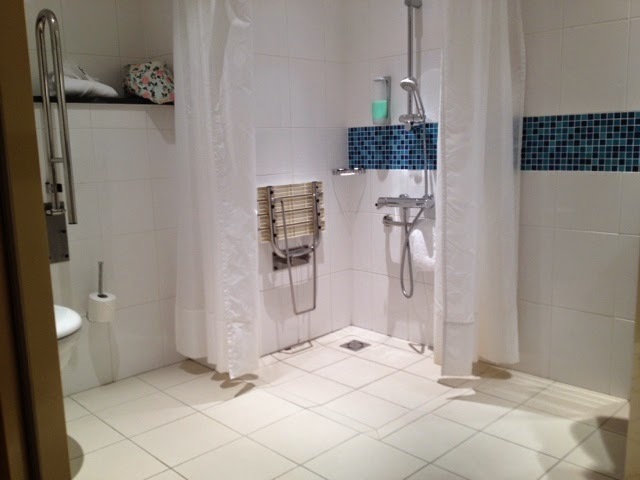 There's an accessible shower and the sink is nice and high to get my knees underneath. The bed needed to be boosted up to get the hoist underneath but that wasn't a problem, the doorways too are really wide and I noticed there's a large disabled toilet in the lobby too, so in all, this hotel caters for its disabled guests pretty well. With the wind blowing a gale (or a "Hoolie" as we say in the Westcountry!) and the rain not intending on stopping, we decided to skip visiting the center of Bratislava and jumped over to the large Avion shopping center across the road from our hotel, which is supposed to be one of the best in the city. It was nice to relax in the dry and do a spot of retail therapy, we managed to stay till closing. Fortunately we found a traditional Slovak restaurant amongst the fast food chains, where I chose Moravian Meat roll which was really tender beef and caramelised sauerkraut with steamed dumplings. Not something I'd normally chose but it might possibly be one of my favourite meals from the trip so far!